Adventurers and outlaws like stumble unto weird and strange finds in caskets and other strange containers for treasures and relics. Some of these objects and devices are of strange and unearthly origin, they have weird and strange ways of defeating those who would violate they're contents. Many are the property of higher dimensional beings who have laid their objects and treasures in our worlds to have an occult anchor to our more pleasant reality. This ivory and gold casket contains the ashes of an ancient god lich emperor whose name is lost to antiquity. The thing is worth about 5000 gold pieces and contains the undead spirit of the the long dead thing whose now completely and utterly insane but attacks as a level draining ghost. This reliquary contains the green moldy ashes of a long dead alien pilot, the thing will awaken as a wight and attack the nearest fool. The container is silver, gold, and jeweled,worth 4000 gold but handling it will infect the victim with a green mold spawn save vs death or become an alien fungal carrier. This casket contains the jewels and remains of a once great queen who resides as a mist borne vampiress. The ivory, copper, and silver container is worth 4000 gold and the jewels which are cursed another 600 gold pieces. This isn't a casket at all but a bio mechanical alien device for animating the remains stored within but the device is damaged and the thing will create a green slime covered zombie thing with double hit points. The device is worth a cool 6000 gold pieces to any wizard interested in the occult sciences of its design. This gold casket is a combination of sorcery and super science, it contains the life essence of five different undead beings mixed together to form a weird elemental demon. The casket is made from solid hellish gold and worth 666 gold pieces. This silver casket contains the gems and jewels of an alien princess but this isn't gems in the tradition sense but the eggs for this weird giant alien cockroach horror. They will begin to hatch when the warmth of a body activates them. The silver casket contains 1d4 binding spells for these alien things. Its worth 6000 gold pieces to a wizard whose into these types of collectibles. This casket is actually a specially made magical cooling unit that can store body parts for hundreds of years. Inside are a collection of 1d20 hands and eyes. The thing is worth 5000 gold pieces to a necromantic cult. This strange casket is actually the dowry for an alien being and contains the souls of eight human wizards who will be given over to the demonic guardians of this princess's casket. She will wed and devour the owner of this object. She will magically appear when it is found.The thing is worth 400 gold pieces and a special binding ritual must be preformed within the first five minutes of its appearance. This cakset is made from the weird brass gold of the Deep Ones and contains a special metal spell book of ancient Deep One lore. The thing is slightly radioactive and has 1d10 spells of 1st and 2nd level written within it. Worth 10000 gold pieces to a Deep One cult but it has a special curse. Whomever finds it must save vs death or be transformed into a double hit point Deep One Guardian. This strange and unusual casket contains a special gateway to hell and some very special and unique guardians will appear when it it opened. This is not done easily and it is a unique solution each time. What is your pleasure Sir? Worth 30000 gold pieces and a special demonic guardian watches over this piece equal to a pit fiend. Do you need a one shot adventure with a solid Egyptian style flavor? 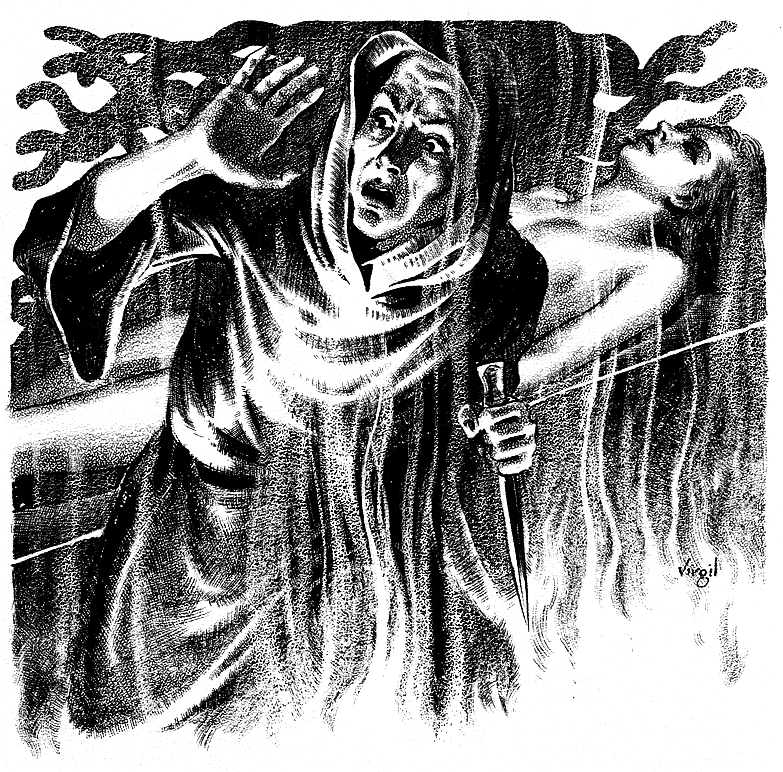 A place of mystery and challenge where your adventurers might be challenged by a pool of mystery, horror, and pulp adventure in the old school tradition? Welcome to the Temple of Set Accursed By Ra and welcome to a new oasis of adventure. Bring extra character sheets. 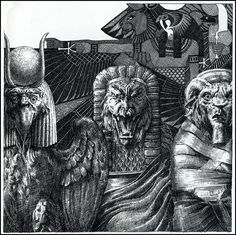 The Temple of Ra Accursed By Set was one of those old school adventure romps that I've been trying to put into a blog post for the last day or so. This is a sixteen page adventure that can easily be inserted into any fantasy campaign that has an Egyptian style desert location. 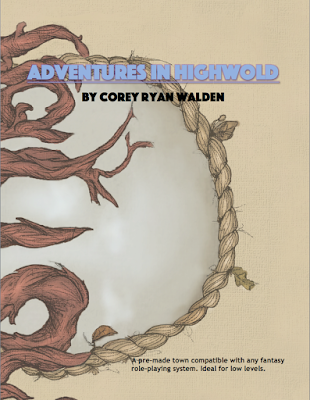 This module makes an excellent addition to any old school sword and sorcery campaign. Seriously this sucker can easily be dropped in and it will challenge the hell out of the players. A grand adventure through an Egyptian-style temple, desecrated long ago by evil forces. Adventuring parties now wander it, searching for loot, and the forces of good have also entered to protect the ancient relics and restore the balance. 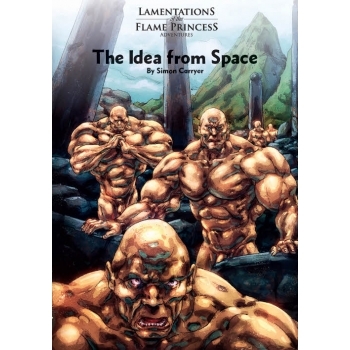 Several new monsters are prominently featured in this 16-page booklet. The temple was originally set up for play in three-dimensional form for use with 25mm lead miniatures; instructions are provided to the Judge so that it can be set up that way. This is a nice quick adventure for a single evening, but is capable of being worked into a larger campaign as the Judge desires. And that's exactly what it is, a single evening sixteen page dungeon set within a framework that can easily work as a touch stone or campaign set piece for the PC's to wander through. Everything about this screams drop this one right into the background of your campaigns. There are enough challenges to take the grins off of some of your high level PC's as well. There are some really nice bits and pieces in this adventure that can be easily adapted into any sword and sorcery campaign that uses a pseudo Egyptian flavor. Do I think that that the Temple of Ra Accursed By Set is worth the download? If your into Judge's Guild products like me? Then yes but there's more to this one then simply a quick sixteen page old school adventure. So what the hell did I do with the Temple Accursed by Ra? Well way back in 2000 something when I was plainly getting entirely sick of the whole D20 glut of product. 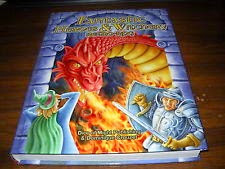 I happened upon a real gem of a massive campaign adventure by this guy Gary Gygax for Necromancer games called Necopolis D20. This massive tome features a fake Egyptian village to start out in. Well the PC's needed a bit of a start into this massive campaign style dungeon and well, since I was wanting to challenge them. I had them buy equipment, provisions, and all kinds of necessary stuff for a minor expedition into the desert to a minor ruin of the main bad guy from Necropolis. This was done with AD&D first edition at the time. The Tomb of Ra Accursed by Set provided the teeth cutting adventure. Baring in mind that I owned the original Dangerous Journeys version of the Adventure I was able to place temple in a nice side portion of the desert. Alright now to up date this module, you can easily fit it into a sword and sorcery game such as Astonishing Swordsmen and Sorcerers of Hyperborea. There are hints and rumors of portals and dimensional rifts bringing temples and ancient Egyptians to the deserts of Hyperborea. Since Necropolis is still relatively inexpensive, it should be an easy add to drop the Temple and Necroplis right into the deserts there. I haven't really discussed doing this with anyone but since this is sort of a thought exercise for me this evening I can merely say that AS&SH as well as OSRIC would be my first choices for running a retroclone romp through the Temple of Ra Accursed by Set. Then simply add in the rest of D20 Necropolis and press go. About 90% of the undead and mummies in the kit are covered in AS&SH. Since I own all of the above, I'd add in some of the more 'special elements' into both Temple and Necropolis as needed. The Temple adventure should provide enough experience to raise characters up to a level where they might and I say again might survive Necropolis but then again they might not even survive the Temple of Ra Accursed by Set. There are some very tricky bits and pieces in this adventure. The artwork is used without permission and this post is a review of an rpg product, there is no intent of copyright or trade mark violations intended. This post is for entertainment and educational purposes only. 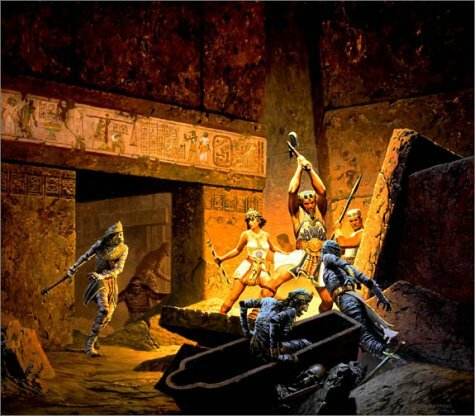 Astonishing Swordsmen and Sorcerers of Hyperborea is not responsible for any opinions or commentary regarding any of the products mentioned in this blog entry. All of this is commentary is from a 2003 - 4 table top adventure campaign. There are times when adventurers sometimes come across unusual and strange finds out in the wastes. Some of these can be very unusual and weird. Some of these can also be truly odd, here then is a random list off odd and more then slightly strange finds for your old school campaigns. There is a 10 % chance of some of these finds being cursed or having far more unique mystical properties then what the object indicates. The crystalized head of some poor soul, every vein, nerve, muscle and detail of the head is intact and visible. Amazingly there is a slight pulse through the crystal of the skull and the rock itself is more then slightly warm. The eye sockets burn with green gold witchfire in the dark. There is a 10% chance that every new moon the skull will share a mystic vision of a possible future or impart a 2nd level spell to its owner. Worth 5000 gold pieces to a wizard of some renowned. A small brass horse statue with a ring of gold around its marble base. The horse is attached to a real ghostly horse's spirit and the animal nays as well as whines in the ear of the owner. The small exquisite work of art will warn of danger and the base's gold ring will glimmer or glow in the presence of any Fey creature. Worth 700 gold pieces. A bishop' miter that contains a small spell book in the hat's brim filled with 1d6 spells of the White school of magic of 2nd level, there is a small silver blade secreted in the seam of one of the tales of the thing writ with protective charms against demons and were wolves. A stone sword with live roses clustered around the sword. They are living and the roots go into the rock of the sword. Demons are seeking this sword and wish to possess it to hide it from a rogue angel whom it belongs to. The thing may be cursed and smells heavily of brimstone. The severed hand of an adventurer with seven fingers each with a mystic or magic ring. The hand will come to life and try to kill any servants of Chaos or evil present when looking it. The hand is worth 2200 gold pieces. This vase shows scenes of gruesome battle and blood lust, the scenes animate and come to life. The thing has strange writings around the lip of the base and it may open a portal to an incredibly dangerous level of the Abyss. Flies, minor imps, and worse wait for the owner. This staff of gold and jet is cursed not reveal all of its secrets, so instead in it seeks out a worthy master who will be the perfect candidate to become a victim and allow the spirit of the staff to possess the poor soul. Suddenly the evil lich will take possession and give several minor levels of wizard to the victim. Ultimately the victim will become a soul clone of the original owner. Worth about 4000 gold pieces. A small statue of Cthluhu ringed with rusty chains, the thing has over 600 chains wrapped in weird patterns around it. The statue allows direct communication with the god thing and the poor fool's mind is subject to its control. Worth 700 gold pieces as a curiosity piece. A golden ram headed flute allows one to have some of the minor abilities as a bard. The thing will summon a demon horror when certain notes are played. Worth 800 gold pieces. The Voltamen are new and very dangerous presence within the science fantasy and post apocalyptic wastelands. This new and dangerous military menace is beginning to make itself know across the dimensions and multiverse. But who are these conquerors from beyond? One of the most dangerous races that adventurers might encounter in wastelands of Accursed Atlantis or any world are the Voltamen. Grotesque, slack jawed highly dangerous and well organized near human mutants with access to super science and powerful black sorcery. There are various tribes and nations of these space going and dimension hopping conquers. Some are short, somewhat hunchbacked, and orange-skinned beings who have access to tremendous military hardware and a lust for conquest. The tall thin green-skinned lizard men warriors to familiar to most wasteland adventurers have been seen increasingly in the various small towns and villages surrounding particularity rich ruins. They have been raiding ruins for super science relics and military secrets of both the Atlantis and Lemuria empires. The Voltamen wear grey uniforms with spiked pith helmets similar to those worn in World War I, and they have jet black eyes with red pupils. The Voltamen are a conquering races from an alternative Prime Material plane, who have a vast interstellar empire. They have expanded this empire five fold over into other dimensions and by the twenty eighth century have conquered a number of nearby alternative and interstellar dimensions into a vast spanning empire. They have access to vast reserves of surprisingly advanced super science and sorcery. Warriors often use standard light weight neutronic lasers which have a range of thirty feet and do 3d6 points of damage. They often have access to tanks,planes, and other military hardware that they manufacture themselves. They seem to have a preference for laser weaponry and other energy weapons. The Voltamen specialize in brutal population suppression and genocide. They are chaotic,brutish, and highly unpredictable and completely amoral and without conscience. They are chaotic evil and use violence against anyone they deem weaker then themselves. The Voltamen speak in a highly complex language of their own, but have trouble with Standard Galactic dialects. They reverse verbs and some nouns during conversations. This has resulted in their not so flattering nick names of the babblers. Yet this does thing to defer from their achievements in time travel,interstellar conquest, and super science military applications. For every 1d10 warriors there will be special psychic warrior or wizard of 4th or higher level. These are trusted advisers or military leaders. 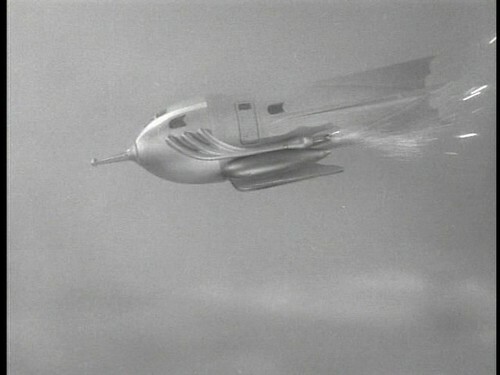 The Voltamen often use nuclear rocket ships as their preferred space platform to move troops,weaponry, and other military assets into field positions. These ships are cheap to produce, quickly built and can often be made from local materials. The Voltamen have used dimensional and time travel for conquest for a very long time. They use doorways and networks of dimensional gates constructed eons ago by the Ancient Ones to move across the planes. Often sending small parties of specially trained special forces and the like to scout out worlds for conquest and exploitation for resources. Thus they may be met in any era or alternative world. They're armies of inter-dimensional troops move in and ruthlessly suppress the local populations, this is followed by the landing of troops and military assets. This pattern is followed by the arrival of a fleet of nuclear rockets and the planetary bombardment of key targets. Conquest begins almost immediately but there have been a growing number of resistance cells over the last few hundred years.The Voltamen will be a continuing menace on any number of worlds and can present a real threat to adventurers who are not expecting these warriors from beyond. There's two brand new free awesome character class resources for the Fantastic Heroes and Witchery rpg system. First there's a brand new awesome Excel style PC character sheet for the game. They don't come any better. All of the nifty little details are right at the players finger tips. The second release is character class extravaganza with a plethora of new character classes and some related variations of some of the classics old school classic PC classes. Fantastic Heroes and Witchery is a game with a ton of creator supported material and the author makes it hard not to grab a hold of his vision and simply go with it. Today are released two new files, available on my website for free download! 1) An awesome character sheet for Microsoft Excel kindly given to us by Arne Holzwarth. Thanks a lot for this excellent work: see download file #4. The sheer volume of support material for the game is both staggering and sort of inspiring. Very cool stuff to see coming out the Fantastic Heroes and Witchery campaign. Thanks for the major updates and expansions! So Hack and Slash Publishing has for a limited time a complete reworking of their famous Treasure compendium. It contains articles by John Bell, Arnold Kemp and Tom Fitzgerald as well as many others. This is an old school well organized pdf of all things treasure for your old school campaigns and its on 'pay what you want' and my suggestion is to do exactly that. This is solid old school take on treasure. 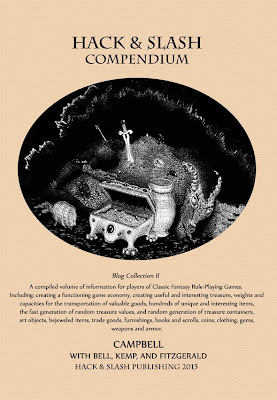 There is a ton of useful and very useful gaming content and anything about treasure is set up throughout the Pdf, you couldn't ask for anything more when it comes to the subject. Things players can spend money on! Weights and capacities for the transportation of valuable goods! Hundreds of unique and interesting items! The secret to creating interesting treasure! Essays by John Bell of the Retired Adventurer, Arnold Kemp of Goblin Punch, and Tom Fitzgerald of Middenmurk! Random generation of treasure, including books, magical books, and book traps! Costs 0$ for a limited time! Affordable print copy available! Throw the guy some cash because basically he's going to be throwing the money straight back into his business to give you even more bang for your old school buck. Everything in all one hundred pages of this book is well done. I can see sitting down and actually using this pdf for a number of games from sword and sorcery campaigns to high fantasy this is a perfect vehicle. Its well done and useful straight across the board for any number of games and retroclone systems. Say you want a monster for a science fantasy alien invasion but a certain copy righted and iconic monster isn't available for you to use in your product or adventure? What's a guy to do especially if he's got fifteen minutes before his players and friends show up? Go into a full panic? Nawwww. Well Ebony Grphyon games comes to the save with a brand new monster, the psyche lasher. 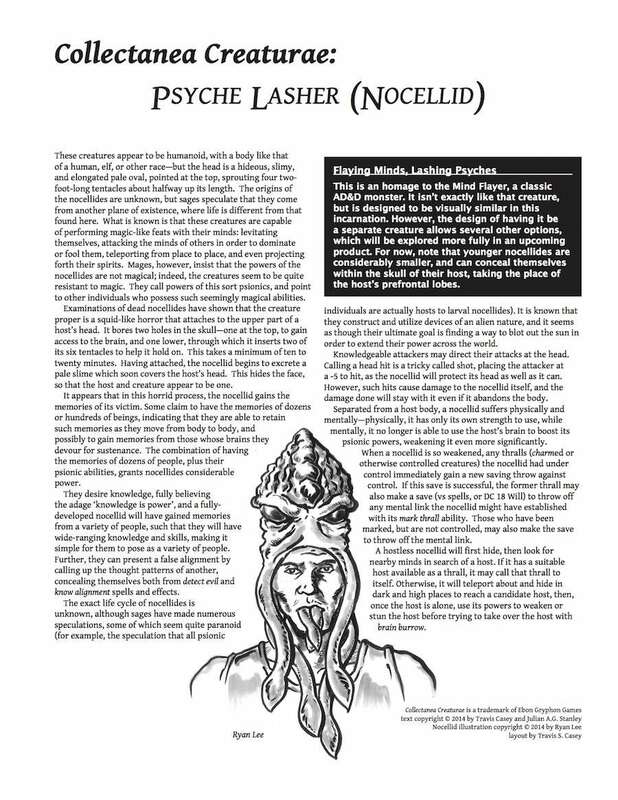 For those of you who'd like to use a certain monster that flays minds in your d20 / OSR games or products, Ebon Gryphon Games presents the Psyche Lasher, an homage to that creature that isn't quite the same, but is close enough to make your players go "Oh, it's a mind flayer --" and then suddenly realize something's different here! Familiarity and a bit of a surprise: it's the best of both! And best of all, our Psyche Lasher is free to use, under either the Open Gaming License, or Creative Commons-Attribution-Share Alike, so you can use the license you like! Well we've got a really nasty piece of work right over here. The Psyche Lasher is a perfect little piece of monster that can easily be added in as part of a campaign of really any type but for me this is going in as part of a science fantasy campaign. This monster comes in multiple formats and has a wide variety of uses for me across the board. The fact that it kinda, sorta resembles a certain iconic monster from the world's most popular fantasy game is icing on the cake. I'm so glad to find this little beauty. The descriptions are for a number of editions and can easily be adapted into a multiplicity of campaigns. The monster gets a full fleshing out but its not done in an over blown style. This is simply meat and potatoes with everything from the basic ecology to methods with a helping of variations on the whole entry of the monster. When your heroes come across blasted landscapes and wastelands that have been infected by 'ghoul' plagues or incursions of negative planar energies, the dead do not rest quietly. The ground churns with the foul magicks and strange creations of the dead. Here are a few of the possible horrors that your adventurers might run into. 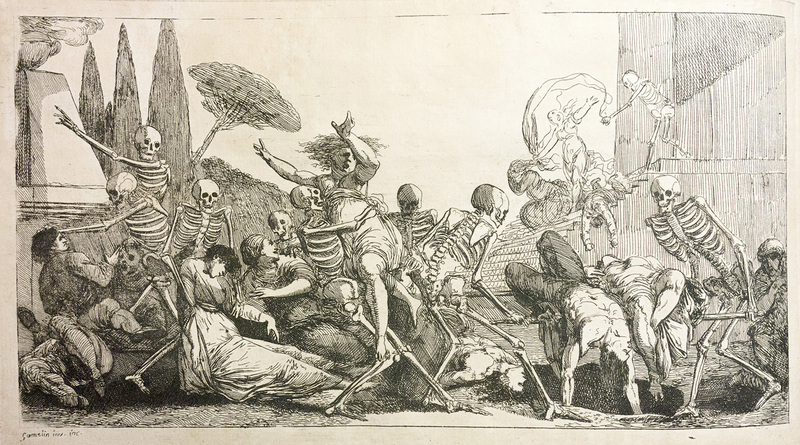 1d6 skeletons hungering for the flesh of the living but covered in the finery of a lost age. Their eye sockets burn with witch fire and claw vacantly at the air. 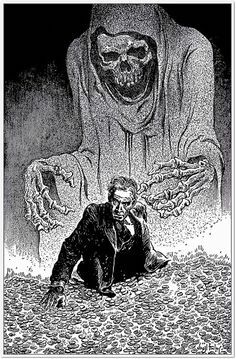 There are over 10000 gold pieces worth of treasure scattered around them but anyone handling any thing that these horrors of ages past have lying around risk has a 60% chance of getting infected by ghoul plague. This group of ruins holds the rotting hands of a gang of wizards who have been turned into a display of horror. The very air around them is hazy and unreal but at the center of this carnal display is a magic sword still sharp as a razor. There will be 1d6 skeletal horrors waiting to spring on anyone attempting to grab it. An ancient spectral tempress stands waiting and watching for a man or woman to enter her domain, she luridly displays her charms and cons whomever she can with her demonic illusions. Anyone entering with 30 feet is subject to a charm spell. A pack of minor demons waits in the wings to devour anyone who is foolish enough to enter her realm. There is a bunch of type A treasure within. A drowned ship has been turned up by the Earth's spasms and 1d8 ghoulish skeletons and undead wait to devour the living. There is a golden urn worth 600 gold pieces waiting aboard and a moldy spell book dedicated to the 'white schools' of magic. A pile of golden skulls four foot high grins at the world and these necrotic horrors will tell prophecies of fortune and doom for anyone who will listen. Each has a minor demon bound within them. They are worth 300 gold pieces to the right collector or wizard. A beautifully bound spell book in crimson and jet gold with silver in lay waits at the top of a pillar. The thing is worth 30000 gold pieces to the right collector but it is the prized possession of a 6th level undead wizard whose soul is bound into the thing. There is a pile of gold and silver coins partially melted glinting in the night or day light. They are actually infected with a horrid slime that will do 3d6 points of damage to anyone handling them. Ironically this slime can easily wash off in running water. A ring of jade sacrificial knives glints in the sun, they're over two hundred of the knives. Each one has a skeleton that will burst forth from under the Earth to murder the fool who stumbles upon them for their nameless gods. Each knife is worth 20 gold pieces at best and their worth is part of the illusion of this place. A table set up with golden plates, finery, and cutlery glints in the sunlight. Food of the most incredible type awaits anyone stumbling upon the scene. Anyone feasting after 2d4 round will hear incredible music and see musicians of a skeletal and ghoulish aspect. The victims will be subject to a charm spell and then 1d8 zombies will burst from the ground armed with short swords and shields to ritually kill the fools. A beautifully carved staff of bone and jet sits in the middle of your adventure location. It belonged to a high level lich and has within it 1d8 random spells and the mind of its owner. It awaits a new body and soul. Take it as you will. There are finds out in the wastes that defy explanation and can 'change' the lives of those whose lives they enter. Here are few weird and more then slightly dangerous relics that can warp and change the way that PC's lives and the very fate of those whose paths they come across. A casket containing the fleshly remains of an ancient demon, the thing's flesh echoes with the occult energies of far reaching demonic life essence. Make a mutation check as soon as the thing is found and it will animate in 1d4 rounds as a ju ju zombie of double hit points. There is also treasure type C in the bottom of the casket. An ancient demonic hand belonging to a lord of the Western gate plane. This hand holds a silver watch like device which will steal 1d10 years from the PC's life but will heal d30 points of damage with strange and alien discolor flesh the next time the character is injured. An ancient lens that shows the past lives of those looking through the thing. A character may gain 1d6 random points to physical or mental attributes but the character will be 'changed' by the experience. Friends and family may not recognize the poor soul and they may lose all benefits of their supporting siblings,friends, family and everyone they care about. This rod is covered by archaic and esoteric writing, the thing is the silvered spine of some ancient demonic creature and allows the owner to call down a lightning strike upon themselves allowing one to teleport 1d8 miles distance in an instant but the poor soul will be hunted by 1d30 minor demons each time its used. This ancient silver skull of a ghoul lord allows one to call a pack of 1d100 ghouls to war.They will come and expect an explanation of why the owner of the skull has summoned them. They expect a cut of the flesh of the kills promised to them in times of war. They will take the caster instead if no war is to be had. The owner gains all the normal immunities of undead while holding the skull. A string of dark glowing crystals that allows one to summon down from the stars a minor spawn of The Old Ones. The thing comes upon leather wings and tendrils, it requires a special sacrifice and will communicate telepathically the maddening secrets of the universe. It will grant 1d6 spells of at least second level and expect more living sacrifices. Jewelry of the Deep Ones - This set of classic Deep One's weird gold allows one to telepathically communicate with anyone of Deep One blood and summon 1d6 Deep One warriors. And these baubles allow one to breath underwater by growing glowing gills upon their necks. This silver vase contains the mortal remains of an ancient goddess of fertility and anyone handling it must make a mutation check. She will grant 1d8 spells for those who ask for help. The vase is worth a cool 30,000 to 50,000 gold pieces. This weird device allows one to be possessed by a god or goddess of high chaos. Those possessed will gain 1d10 mutations and become a minion of the god thing that they summon. This long green emerald rod contains the accumulated knowledge of a lost race. The thing shakes around the energy of the gods and grains the owner visions of hellish events to come and allows one to summon a hunting horror as well access to 1d10 spells of a decidedly Lovecraftian flavor.Worth about 50,000 gold piece to the right collector. Some days I'm very late coming to the gaming table; in this case last night about four A.M. 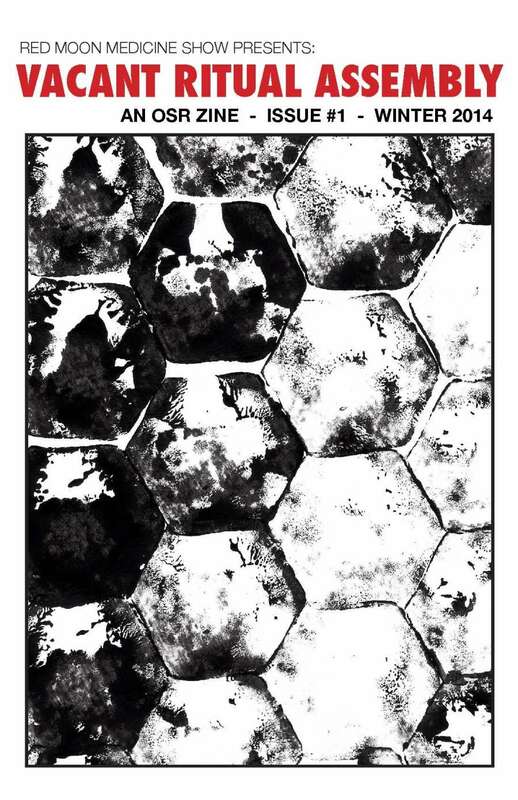 I found this little gem of a pdf called Adding Unspeakable Horrors From Beyond The Stars To Your Game pdf. The download looks clean and there are some real gems in the rough to add into your OD&D game or retroclone system. This should work with Moldvay '81 OD&D but with Labyrinth Lord, Swords and Wizardry,etc.You can download this pdf directly from the Dragonfoot thread and open at your leisure. Special thanks to Steve Stewart for putting this pdf together. Cheers Steven. There are extensive weird sarcophagus in many of the crypts out in the wastelands for adventurers to find, some of the most dangerous inhabitants of crypts and other extensive grave yards and ancient cemeteries are simply waiting to claim adventurers to their own final rewards. Here's a listing of some of the most unusual and dangerous horrors out in the middle of the Accursed Atlantis wastes. There is a 30% chance of a trap being in place in a crypt or upon one of these ancient caches of remains to keep PC's on their toes. Check your old school set of rules for a matrix table of possible traps and tricks waiting in the wings for the careless adventurer. This extensive fifteen foot marble like stone coffin shaped object is the final resting place for a very large alien god thing. The horror is surrounded by weird golden metallic artifacts worth 4000 gold pieces but carrying a strange alien fungus upon them. Every inch of this coffin shaped mechanism holds ancient magical writing upon it. It is actually a spell book like set of weird writing that contains 1d10 spells. There is a 10% chance that by merely glancing at them an ancient curse of wraith will be put upon the head of the reader. Inside a strange bird headed lich rests. The thing will be very pissed off at having its eternal rest disturbed. It has treasure type C inside buried with it. This alien looking bio mechanical coffin shaped box contains two alien bio mechanoid things fused together eons ago. They will telepathically share 1d4 spells of a necrotic nature but the experience will drive the victim temporarily mad. He will be stunned for 1d4 days afterward.The box contains type Q artifacts. This elaborate gold and silver nine foot long box contains, nothing. Raiders were here before you but the box is worth 700 gold pieces. And there's a wand of alchemy in the bottom of the box but you've got to search. This box contains a giant cat mutant monster undead and it will be very ticked if woke up. 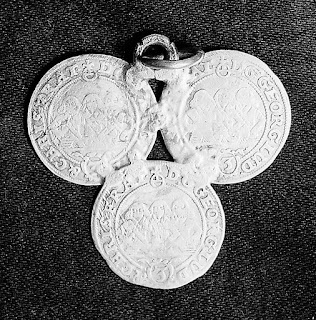 There are several sets of silver chains binding it in place worth 5000 gold pieces including several semi precious gems. This crypt contains a sleeping adventurer who has been secreted with 60000 gold pieces worth of gold and books. But a major demon lord watches over her. She has a demon blade by her side and she is a 7th level fighter. An ancient alien astronaut wight sleeps the dreamless sleep of ages but holds a dangerous grudge against humanity. The thing is armed with an energy weapon and several charged clips. The weapon is easily worth 7000 gold pieces to the right wizard. This place is home to a demon who is being tormented weekly by a wizard who has trapped the thing between worlds and seeks answers about the type C treasure in this room. The demon is likely to curse anyone who does not show mastery over it. This crypt is home to a dimensional doorway to the first level of Hell and guarded by a dangerous soldier demon thing. There are extensive treasures here the result of other heroes dying in the past. This crypt is the home to cult of necomancers who meet here every new moon, there is an extensive treasure vault here but it is guarded by 1d8 ju ju zombie warriors who would be happy for some action. They are armed with +1 short swords and wooden shields. 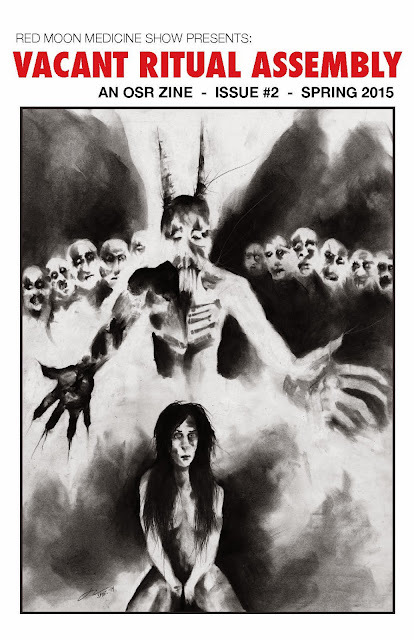 There are few fanzines that can actually shake up your old school horror campaigns, Vacant Ritual Assembly Issue #1 does a damn fine job of making things very,very, interesting for your PC's in a Lamentations of The Flame Princess campaign or any OSR style game. If your looking for a good solid set of OSR downloads then look no further then Corey Ryan Walden's material. You won't find a better set of old school town materials for your campaigns. The gentleman has generously supplied his materials for free and their perfect for your retroclone or old school needs. 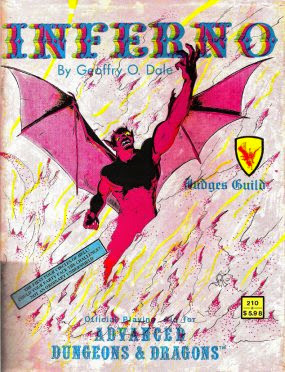 Review and Commentary On Spellbook Games Inferno Bestiary, Second Edition For Your Old School Campaigns. Athanasius Kircher Patron Saint of Atlantandria Port City Of Accursed Atlantis My Old School Campaign. If there's one influence on my Accursed Atlantis campaign its got to be Athanasius Kircher a genius Jesuit madman and philosopher whose works touched on everything from alchemy to volcanoes. He's been my go to source for more then thirty - five years. Athanasius Kircher, S.J. (sometimes erroneously spelled Kirchner; 1602–1680) was a 17th-century German Jesuitscholar and polymath who published around 40 major works, most notably in the fields of Oriental studies, geology, and medicine. Kircher has been compared to fellow Jesuit Roger Boscovich and to Leonardo da Vinci for his enormous range of interests, and has been honored with the title "Master of a Hundred Arts". A resurgence of interest in Kircher has occurred within the scholarly community in recent decades. 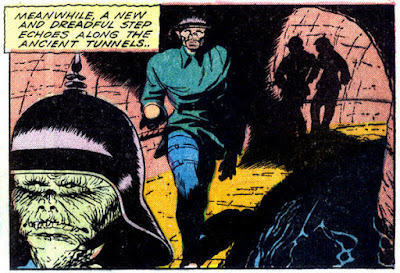 His map on Atlantis and its environments provided my wastelands of science fantasy and high weirdness for years since I first encountered him back in middle school back in the 80's. 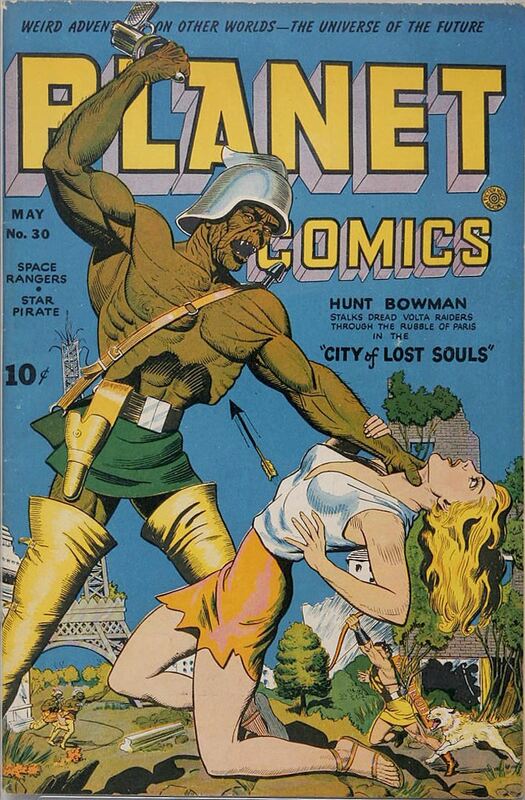 The Atlantian wastelands are rife with cults and strange religions, mutants, and much more. 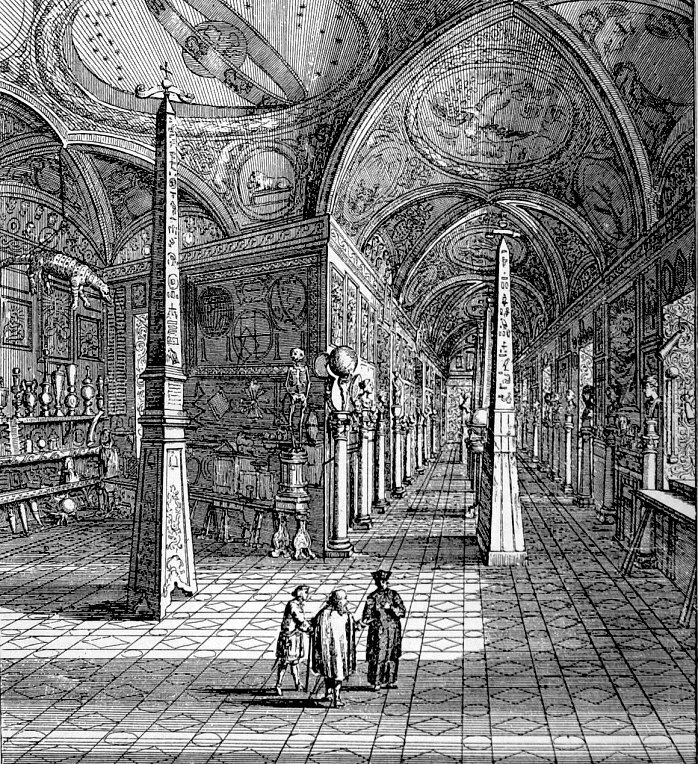 So for years now Kircher has been my go to inner world Jesuit madman guru, his ideas on the inner Earth, and Egypt were pretty ground breaking and sensational at the time. But completely and utterly wrong. So for the past couple of years I've been pulling from his works ideas, artwork, and some incredibly wonderfully weird stuff. 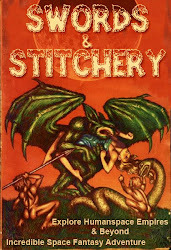 Weird Lovecraftian cults, high alchemy formulas, and all kinds of occult stuff and more has trickled in from Kircher. His interests and underworlds are vast,his vision imposing, and his ideas are very far reaching. Kircher proved illustrations for more megadungeons in high school and college then I can shake a stick at. His recent appearance have been in some of my At The Earth's Core campaign work with Crypts and Things and now Fantastic Heroes and Witchery. Straying to near some of the colossal and grandiose Lemurian ruins can for adventurers be a fatal experience in quick reflexes. For a predator of extremely aggressive and dangerous aspect lurks nearby, the The Giant Allorian Mutated Sharp Toothed Salamander lies in wait. This large and extremely dangerous predator haunts the rivers, lakes, streams, and swamps just waiting to snap limbs and take anything that strays too close to its domain. These horrors lay in wait in the Lumerian swamps originally being imported in from the Allorian colony worlds. These horrors gene pools took a vast dose of Entropic fallout during the sink of Atlantis and Lemuria. These horrors are over thirty foot long and cruise the swamps in search of prey. They surprise on a 1-4 and rake the poor victims with their claws, they have horrid tooth filled maws that inflict terrible wounds.These monsters attack with two sets of retractable claws on the first round or two followed by a series of bites. The prey is dragged back to the nest sight dams of these amphibious horrors where the family tear prey to pieces. On a natural twenty the creature picks up the prey and inflicts even more terrible wounds as the creature tosses the poor victim around like a rag doll. Once this has happened the horror will bite yet again to make sure the prey is completely and utterly dead. These horrors often sport 1d6 minor mutations only adding to the utter horror of the giant Allorian Mutated Sharp Tooth. The salamander's dens are filled with the torn cloths,equipment, bits and pieces of treasure and all kinds of remains of victims from past meals. Adventurers often seek these places out to grab the choicest pieces of treasure only to become another meal for these horrors. There is a standing bounty of 400 gold pieces for the skulls of these horrors from kingdoms that surround their territory. In some places these horrors are captured for use in off world gladiatorial combat. There are some items of treasure that shouldn't be found, items that were left behind on the battlefields of existence that can prove to be far more dangerous to adventurers then they first realize. Here are a few of those items that might prove to far more dangerous then valuable. Necklace of weird greenish gold made with weirdly inscribed runes on the piece. They are actually a summoning rite for a 'hunting horror'. As soon as this thing is put on the rite is enacted.The wearer is the sacrifice. The piece is worth 1000 gold pieces but also cursed but certain cults will pay 10000 or more gold pieces for it. A strange wrought iron chest inscribed with thousands of pieces of mystic writing across its surface. The thing is actually the holding chamber for a 'colour of space' which is ready to burst forth and wreck havoc on anyone caught by it. A golden plate writ with alien writings and strange glyph symbols that summons an ancient tentacled horror from beyond time and space. 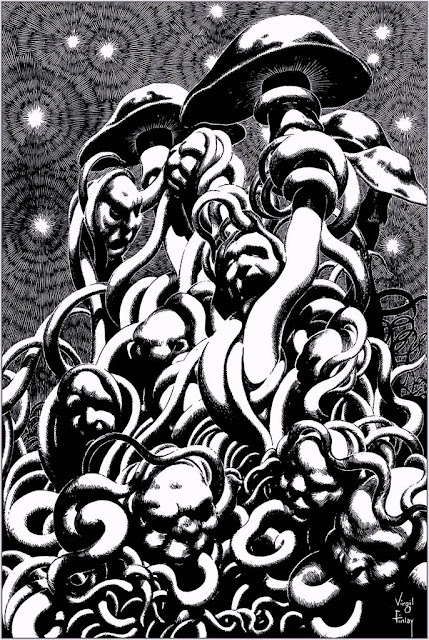 The thing is an aspect of Nyarlathotep and loathes humans and near humans,it lives only to spread mayhem and chaos. This chest of seeming gold contains an alien fungus colony and wishes only to spread cause chaos as well as summon its immortal,unknowning masters from beyond the stars. Anyone caught by it is infected in 1d6 rounds unless a save vs.death is made. The chest is worth 10,000 gold pieces by itself with incredible silver workings. A strange ankh cross of weird design wrought with ancient symbols of despair and high magick this thing summons 1d8 dimensional shamblers who will come to carry the user away and tear him apart as sacrifices to their unknowing masters at the four corners of ultra dimensional unreality. A strange iron wrought box that contains what seems like a haul of 1d100 jewels of beautiful but alien aspect. These things are actually the eggs of a very dangerous nature and 1d100 weird Lovecraftian things will come down from the stars to claim the owner and spread madness. They are seemingly worth a small king's ransom. A priceless jewel is actually the weird essence of ancient god thing and is looking for a new housing for its immortal essence. The thing will try to possesses any wizard or priest who picks up this beautiful bauble. The target must save vs death or be the housing for this priest who will try to call down his masters to claim this reality as their prize. This beautiful jade statue's hand is a perfect seeming representation of a person's delicate hand. The thing is actually the sorcerously held hand of some ancient demon thing from beyond space and time. It will come to claim its ancient hand anyone else present taking them back to its cold damned hell beyond the pale of man themselves. Worth about 8000 gold pieces to the right collector. A golden statue's bust of some dignified and wise man lost to the ages. In gold alone it is worth a cool 40,000 gold pieces at the base of the neck is group of closely cropped hieroglyphics. These ancient Atlantian spells will summon one of the dangerous elemental demonic spirits of old which will proceed to turn the caster and everyone present to beautiful golden statues themselves. But the 'gold' is actually an elemental plague that will spread with the merest touch of anyone. This beautiful Jade demonic statue is seemingly worth a cool 4000 gold pieces. Upon its base is a group of closely cropped and nicely done spell symbols of ancient Atlantis. These spells once said aloud will break reality and allow things from far outside in. And even if the dimensional doorways are closed there will still be a nice pinprick in reality allowing some unintentional visits from 'Outside'. 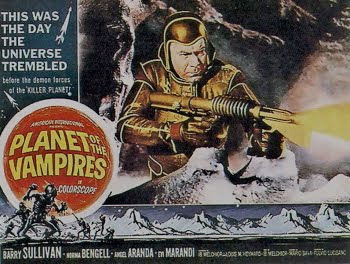 The Charlton company from Derby Connecticut had among their silenced properties, Space 1999 back in 1976. 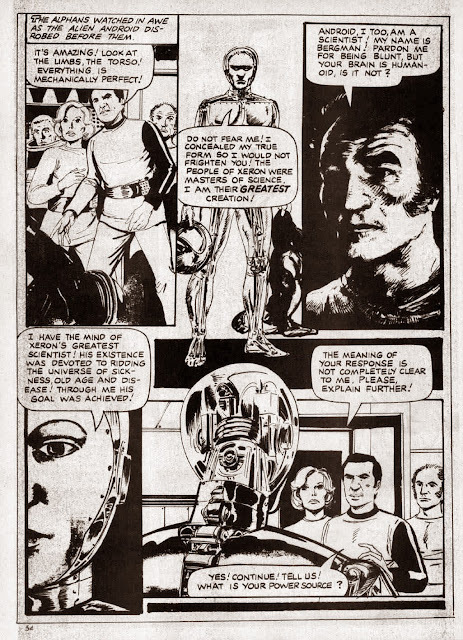 There was a particularly haunting and odd story which featured a very memorable android character who would make a fantastic NPC for a space opera game. 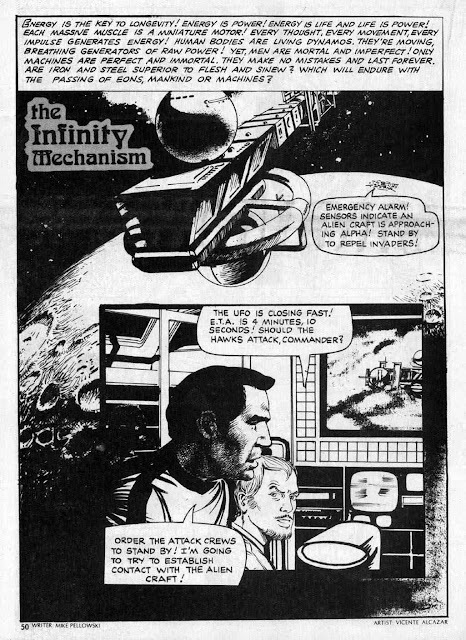 Charlton's black and white Space: 1999 #6 story (cover-dated August 1976) and by Mike Pellowski and Vicente Alcazar features the "The Infinity Mechanism". One the things that was odd in the story was the mention of the Hawks space craft. These were assumed by many fans myself included to be only featured in the Space 1999 episode War Games. 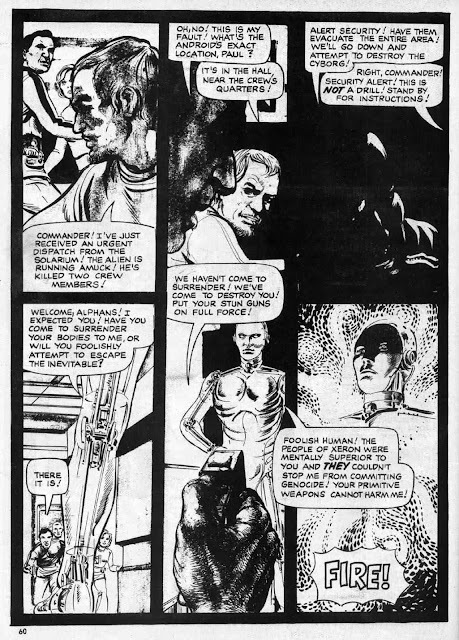 But recently rereading the comic contingency the Hawks were a regular part of the make up of Moon Base Alpha. 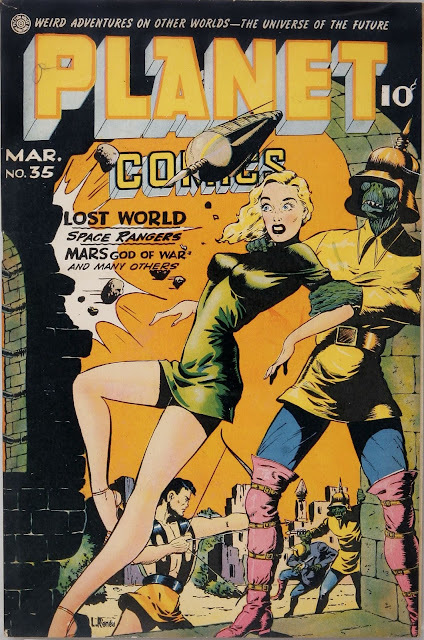 One of the things that was very interesting about this story is the 70's space opera vibe that echoes throughout the story from the groovy space craft see on the first page. To the 1970's astronaut suit as well. There's some very cool about how this story is put together from the strong characterization to the fact that your own PC's could easily stand in for the Moon base crew. The mechanism from Xenon called Infinity looks like a Robocop cyborg reject but the fact that he has an organic mind makes him something very interesting. He easily be a stand in for a number of cyborg NPC's in a wide variety of campaign universes. But he's not simply a cyborg or an android, he's actually a lich like level drainer. He's got the appearance of a simple 'Andy' but in fact he's murderous cybernetic horror on the loose. Given what and who this android horror is, I would say he's got a couple of levels in cleric or another old school wizard class. He's swift and very dangerous as well as simply waiting to drain the hell out of anyone on Moonbase Alpha. Infinity is a prime canidate to get a reworking over into a Stars Without Number or another old school retroclone system adventure. This particular character has a ton going for him. And he's perfect fodder for going into a campaign to play merry havoc on a group of old school gamers. What makes this issue so solid is the black and white artwork that has so many old school bits that its perfect fodder for adventures. Infinity is perfect fodder for an old school adventure complete with murderous android. This story's plot like could easily be adapted into any number of retroclone rpgs. For the Xplorers rpg system Infinity is going a perfect foil for either small party of adventurers or as a hazard left behind on some forgotten remote corner of the universe. For Stars Without Numbers Infinity is perfect material for depicting an A.I. whose far exceeded its programming and must be taken out for the good of galactic society.